There’s always something special about young adult pirate books. They seem less bogged down than adult books at times, and often revel in a fascination with pirate mythology that’s both nostalgic and timeless. 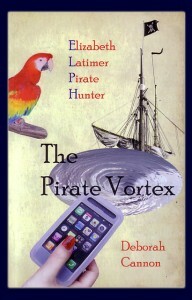 The Pirate Vortex by Deborah Cannon, however, is a strangely different beast altogether. Hardly timeless, it’s rather decidedly contemporary as it follows the adventures Elizabeth, Lulu, Wang, and CJ (a rather foul-mouthed parrot) as they search for Liz and Lu’s mother, being a pirate archaeologist who suddenly disappeared. Bilgemunky Radio 119 – Cows and Magic. Magic Cows. Tonight’s show was traumatized by Pirate Magic part 2, as well as the Old Dunn Cow. Experts may disagree as to the merits of either, but none of us escaped without some damage. I don’t know, but this movie just screams of exploitation to me. When will people learn that you can’t go around using pirates for amusement? I’m just sayin’. And while we’re on the subject, just how many times does Willy need to get himself rescued before he learns his lesson, anyways?